I was surfin' around and made a stop at Connie Babbert's blog. I saw she had a SUPER cute card and she was playing along with Mary Jo's Lunchtime Sketch Challenge TSSC162. 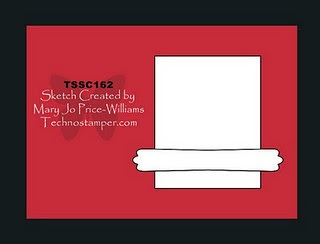 I was inspired to make a sewing card because I thought Connie's was so dang cool. Here is what I came up with. It's a mix of the Sew Suite stamp set with the Ice Cream Parlor DSP and Quick Accents. 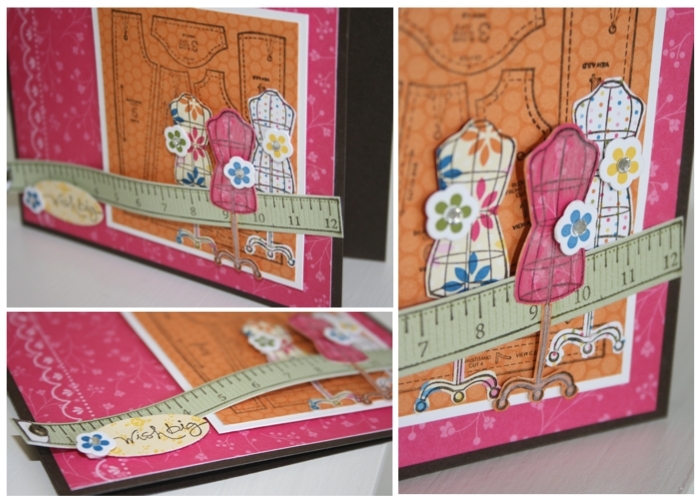 I also used the Pattern Pieces background stamp along with the Short and Sweet set of stamps. I did add a touch of Moonlight Accent smooch Paint to the center dress form. I wanted it to have a chrome effect and I kind of like it. Ahh, another great card with this set. I too loved Connie's. Thanks so much for playing along, you card is just perfect.